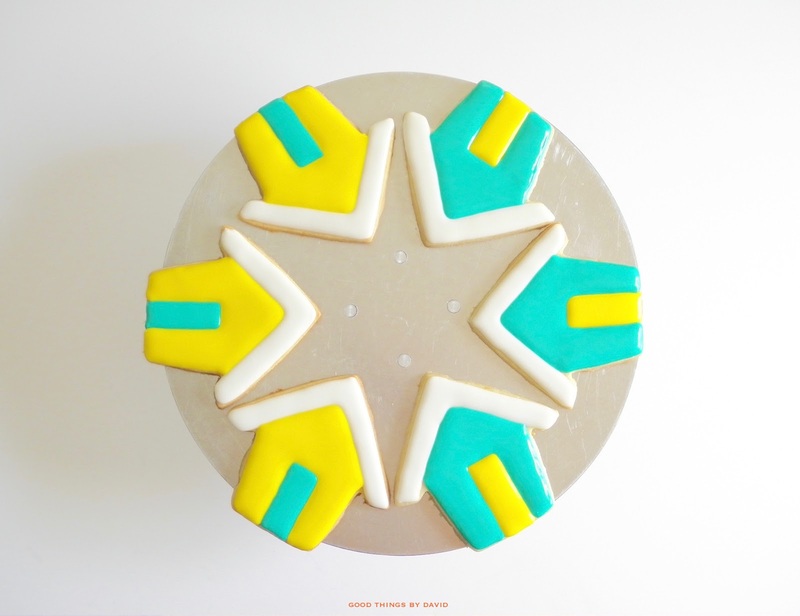 Shipping fragile sugar cookies that are decorated with royal icing require special care. 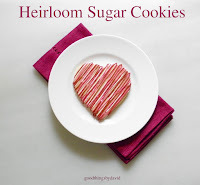 These types of cookies get baked on a monthly basis at my home, and more often than not, they are shipped throughout the United States to friends, family and clients. I try my best to ensure that the treats arrive in one piece because it would be a waste of my time, material, expertise and money if I were to be neglectful in their packaging. What I've learned throughout the years of mailing out hundreds upon hundreds of cookies is that you must have a sturdy box, lots of packing peanuts, small-bubble bubble wrap and perhaps some cardboard cut outs to use for layering. 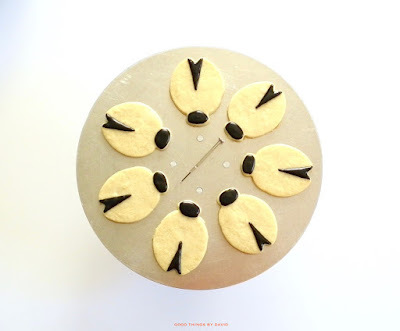 Moreover, the sugar cookies themselves must be rolled out to a thickness of a solid 1/4" to give them the firmness required for shipping. Anything thinner will have a greater chance of breaking into small pieces or snapping in half. 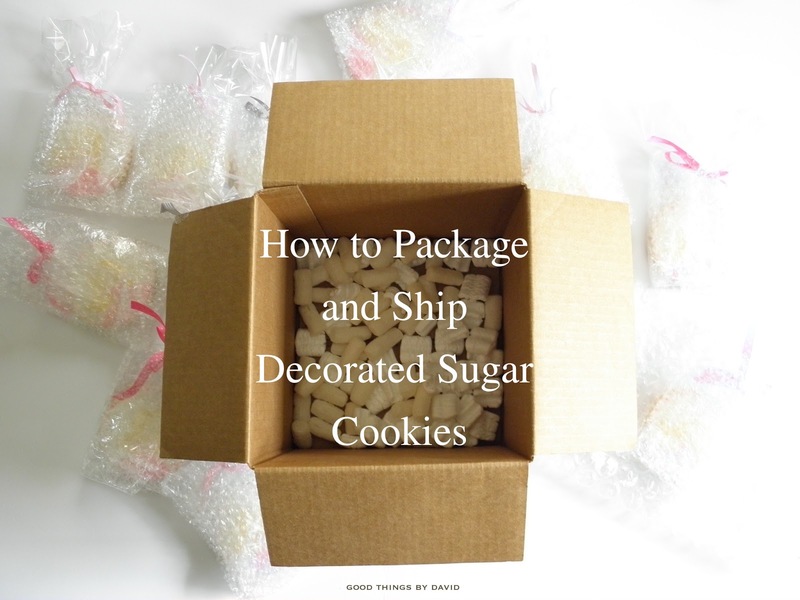 Learn from these tips so that your works of edible art arrive at their destination in one piece. 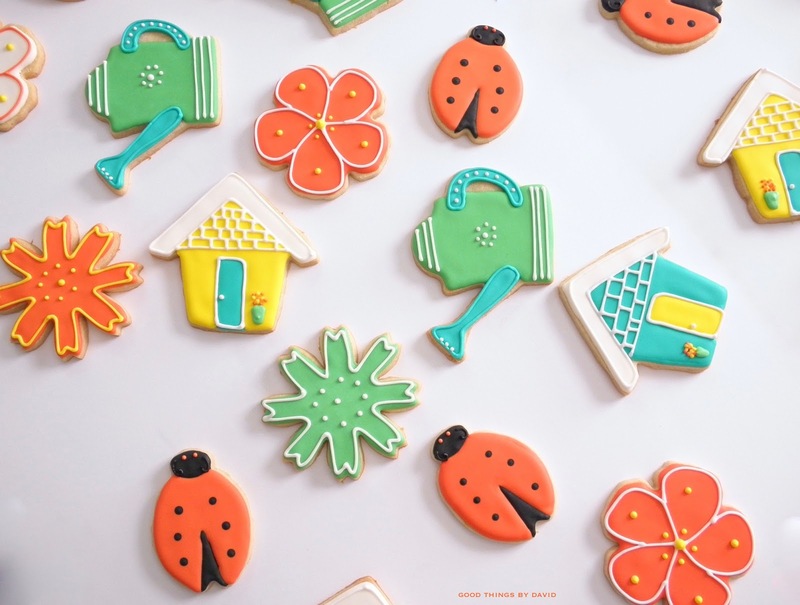 I guarantee that you will have peace of mind as the cookie decorator if you follow these simple steps, and that the recipient(s) of the cookies will appreciate the care you took in making sure that they arrived safely. 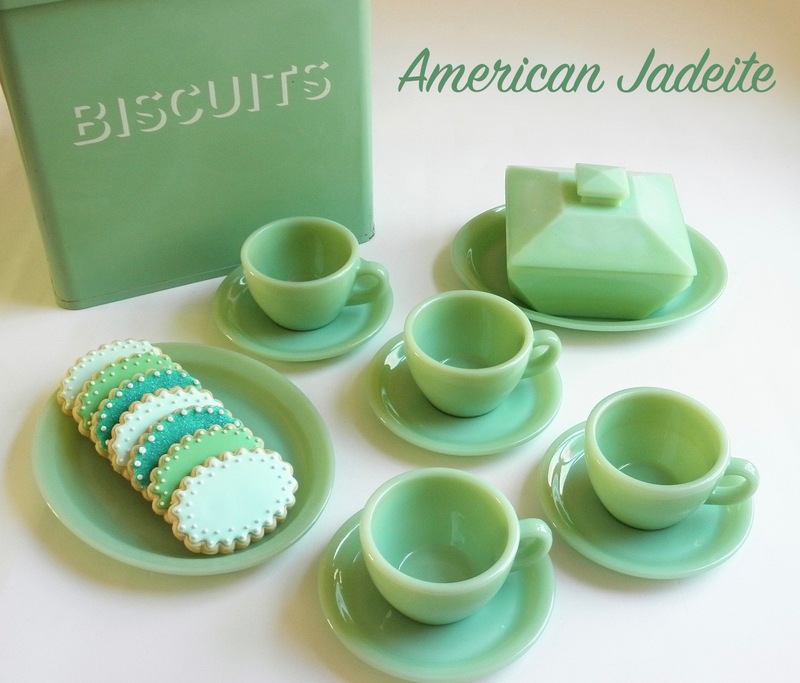 If truth be told, I can't remember the last time one of my cookies arrived broken. 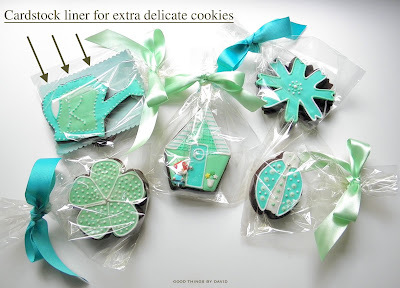 My preferred way to package up cookies for gift giving is to place cookies in cellophane bags tied with colorful ribbons or natural twine. However, if you are keen on those clear-topped boxes that you assemble and line with crinkle paper, even better. 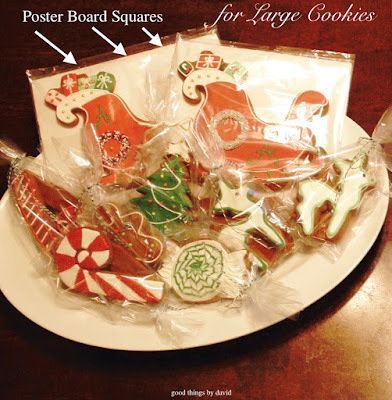 The best types of cookie shapes to place in clear cellophane bags are squares, rounds, hearts, rectangles or flowers. Any other shapes which have delicate edges or extended areas, such as the spout on the watering can above, need to have support underneath so that the details don't snap off. 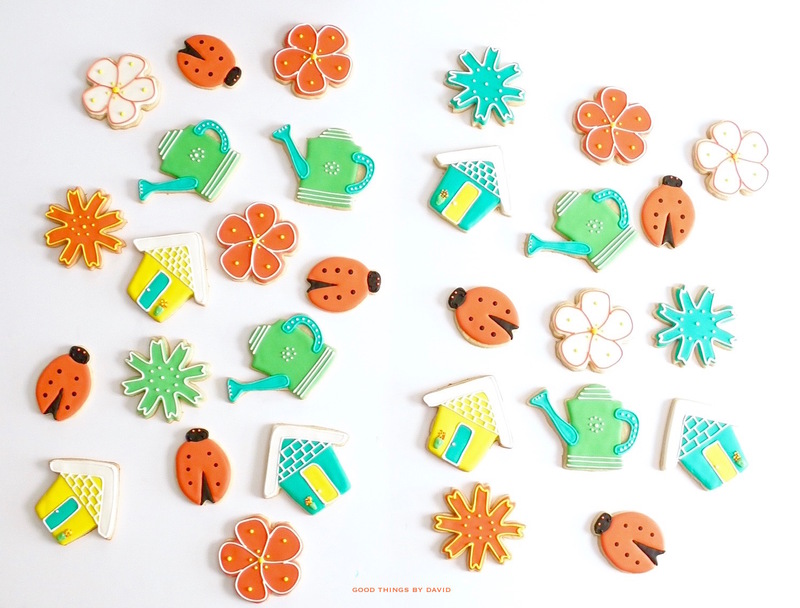 I like to use stiff cardstock that's approximately the same size as the cookie. The cellophane bag gets lined with the piece of cardstock, and then I carefully place the cookie on top of that. Easy! Note: extra large cookies, like those cut out and baked with the large Martha by Mail cookie cutters need even more support to keep them in one piece. I've found that thick posterboard cut to size is the best way to keep them from breaking. You will need very large cellophane bags to accommodate both the board and the cookie. Once your decorated cookies have been packaged up in cellophane bags and tied securely, cut out as many 12" squares of bubblewrap as you have cookies. 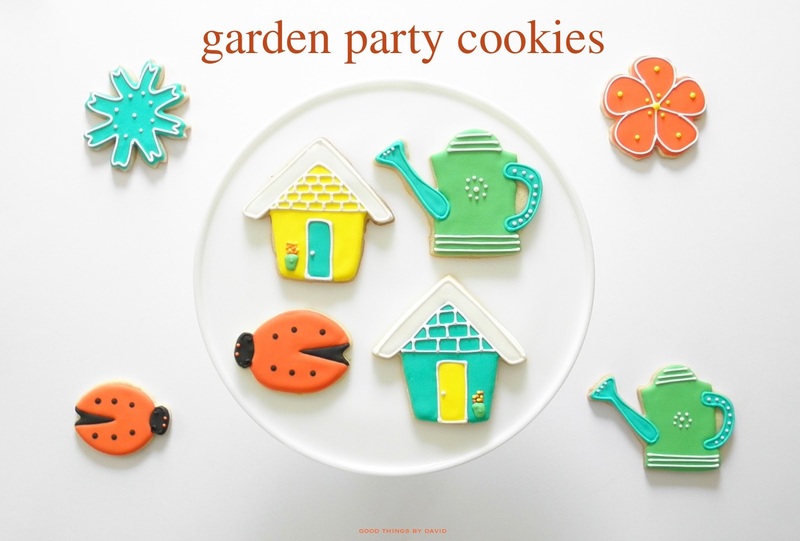 It's time to create cookie bundles! A. 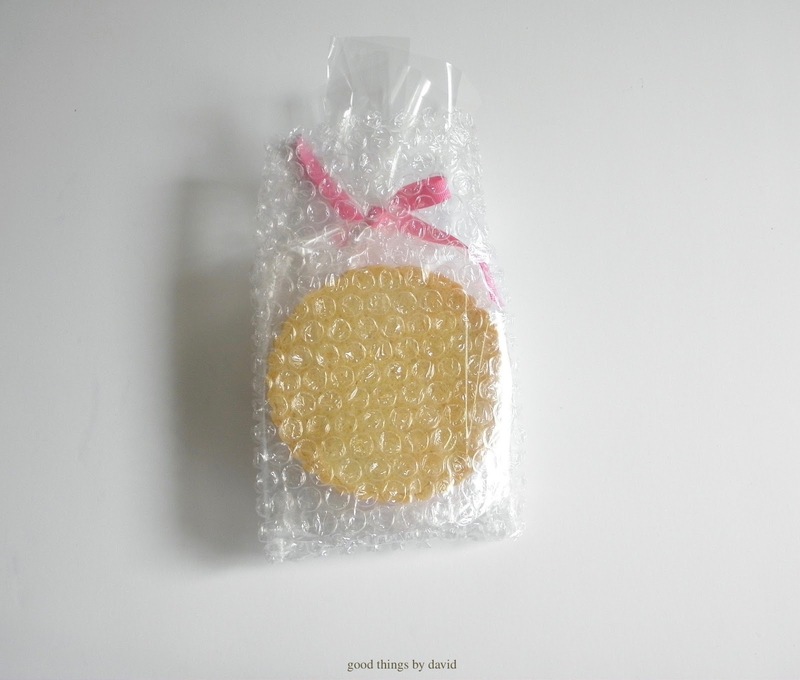 Place the cookie in the middle of the bubble wrap, bubble-side up. B. 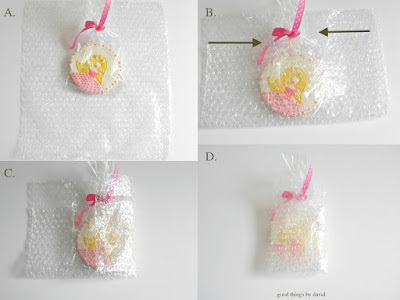 Fold the bottom portion of the bubble wrap over the cookie and secure the ends with some scotch tape. C. Fold both sides of the bundle toward the center and secure each with some scotch tape. D. Your cookie should be a tight fitting bundle securely wrapped and taped. Continue wrapping and taping all of your cookies. 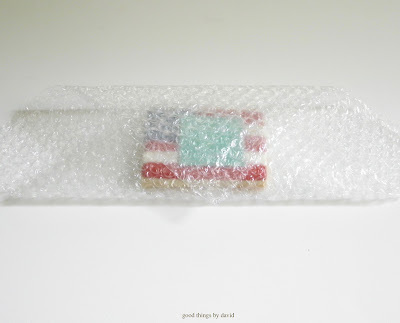 This is the back side of a wrapped cookie bundle. 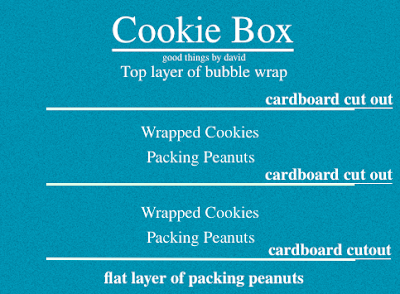 You can also wrap a cookie by shifting the square of bubble wrap so that it's at an angle. 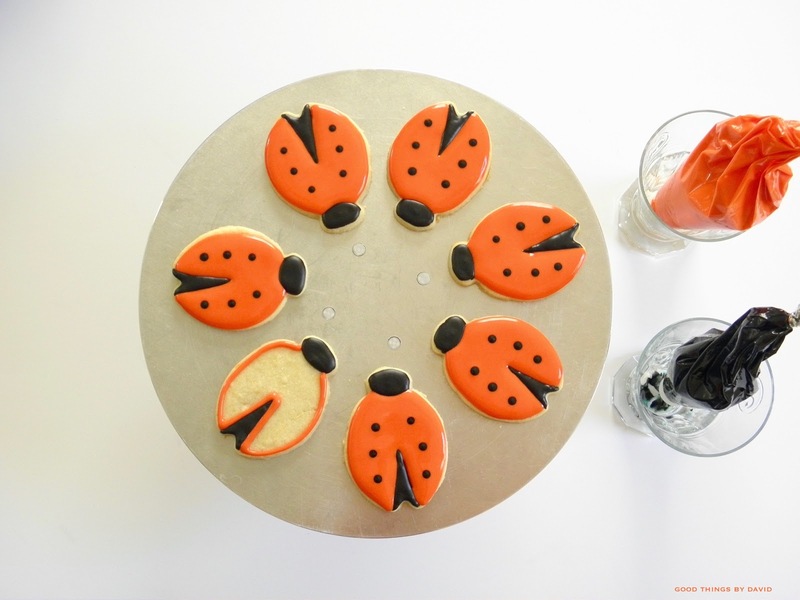 The goal is to make sure that each cookie has enough padding around the front and back. 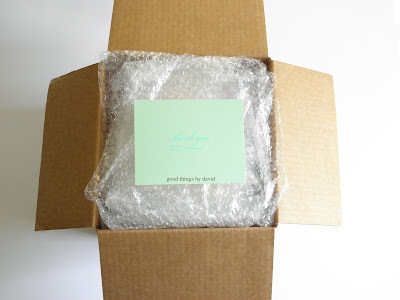 Your shipping box should be a heavy duty box that will withstand the rigors of transportation. 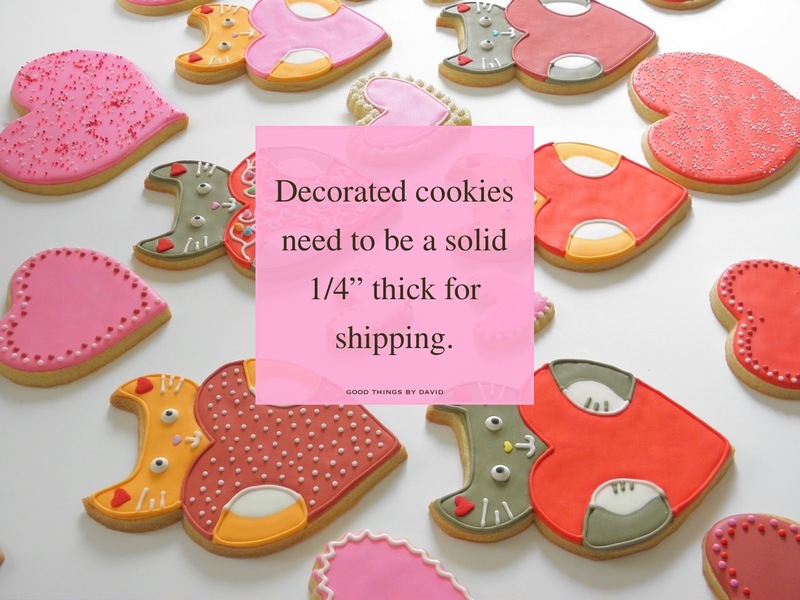 Find one that suits the number of cookies you intend to ship. It's up to you whether you want a square box or a rectangular box. 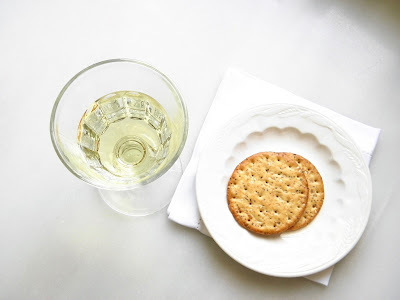 The former is great for smaller amounts and the latter is perfect for larger quantities or cookies that need extra padding. Line the bottom of the box with a flat layer of packing peanuts. Don't leave any peaks or mounds of packing peanuts for this bottom layer. Add a layer of bubble wrap. It's wise to line the walls of the box with bubblewrap to give the sides extra padding. I take a roll of bubble wrap and simply drop two long strips overlapping each other crosswise (much like lining a baking pan with parchment when making brownies). 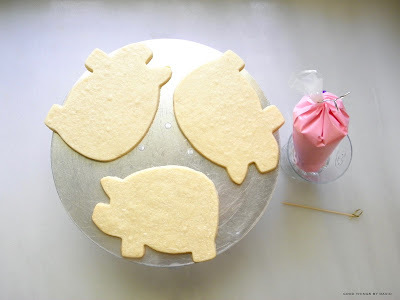 Add a cardboard cutout at the bottom and begin to add cookie bundles. Keep the cookies flat along the cardboard cutout and fit as many as you can without forcing the cookies. 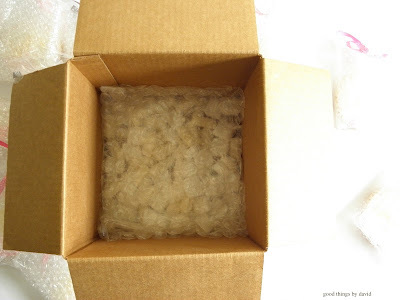 Add packing peanuts to fill in any gaps, especially around the edges of the box. Lay another piece of bubble wrap, then a cardboard cutout, and repeat the layering process. Here is a diagram of what the layered box should look like when it's finished. Starting from the bottom and assembling the box until it's filled, the finished package should be a series of secured layers. 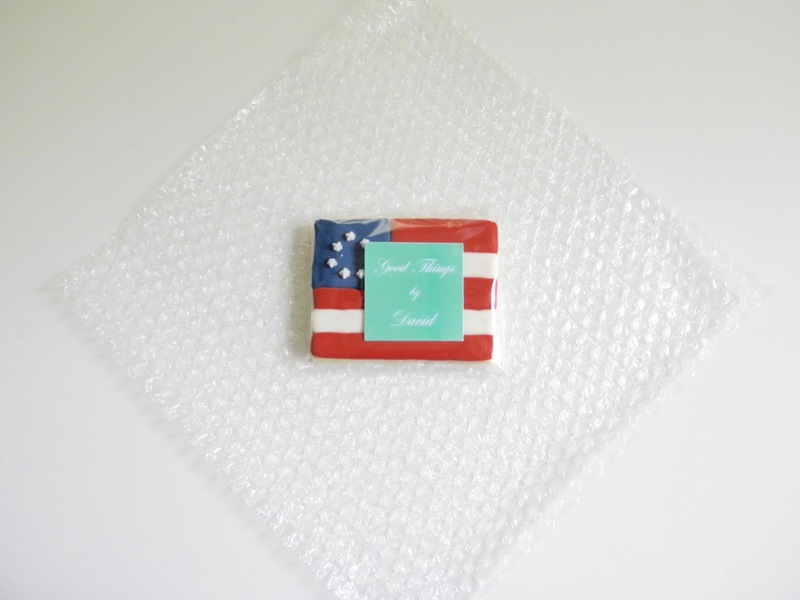 The upper layers should really be nothing but bubble wrap and packing peanuts (and a note or card!). You want to have enough packing material so that nothing is shifting. When you close the box, before taping it shut, give it a few small shakes. Is anything moving inside? 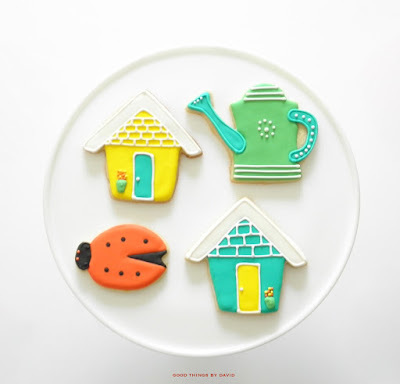 Do you hear cookies sliding? If you do, find out where the problem is and secure it. 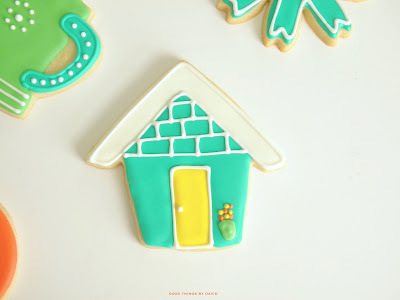 If you don't hear a peep out of those cookies, then it's safe to tape shut. I never like to skimp on packing material whenever I send cookies through the mail. 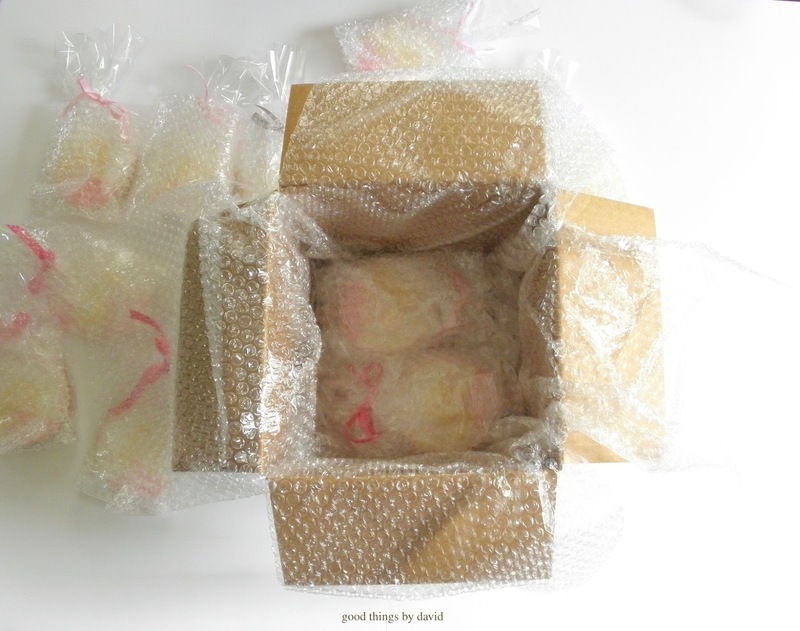 Whether it's bubble wrap, packing peanuts, packing tape or boxes, I like to have plenty of them. Adding a few stickers that say 'Fragile' helps, but so does a clearly written or typed address label. The box itself should be taped with clear packing tape and it really should be mailed out the quickest way possible. Personally, I've had a really good success rate sending everything USPS Priority Mail with tracking and delivery confirmation. If you're selling these to a client, make sure to insure the package as well. 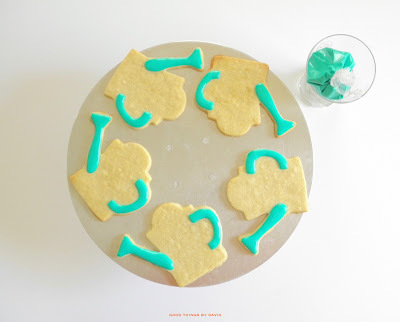 My wish is that this small tutorial helps you and gives you the confidence to send those beautifully iced sugar cookies to as many individuals as possible. It's great to hear from family members, friends and customers when everything arrives in one piece. 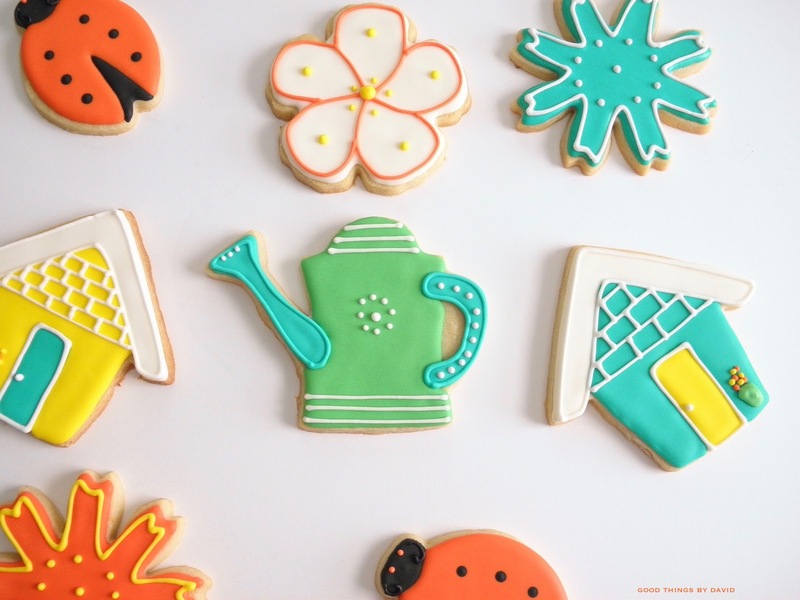 Happy baking and happy cookie decorating! 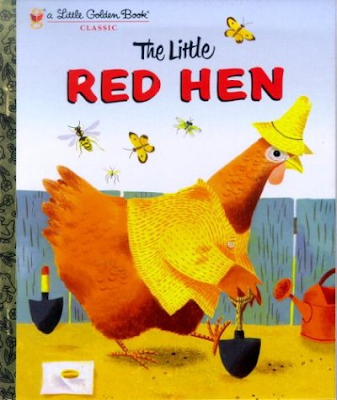 'The Little Red Hen' is a familiar children's book published by Little Golden Books, and many kindergarteners are taught the virtue of work ethic through its story line. Told from the perspective of the little red hen and her barnyard friends, the book is a classic and a favorite with kids. 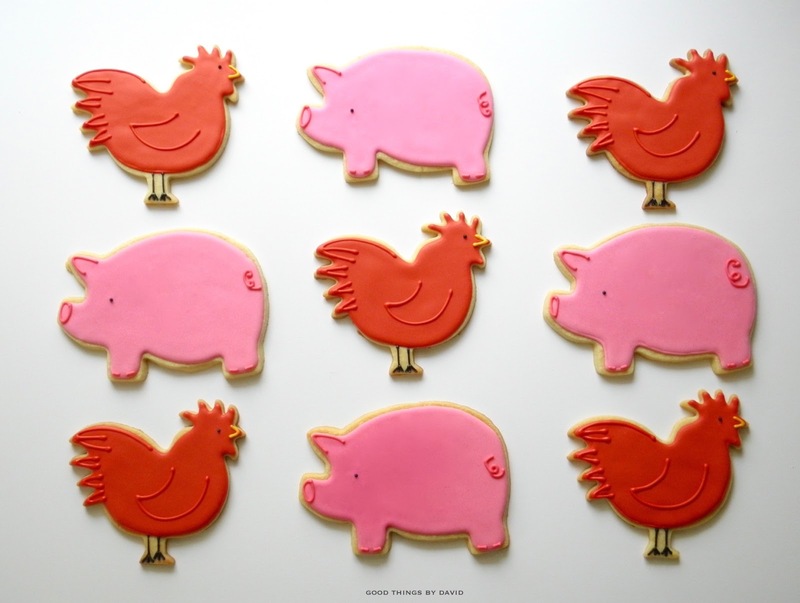 I was recently asked to make a set of cookies for a classroom that was putting on a production of 'The Little Red Hen'. 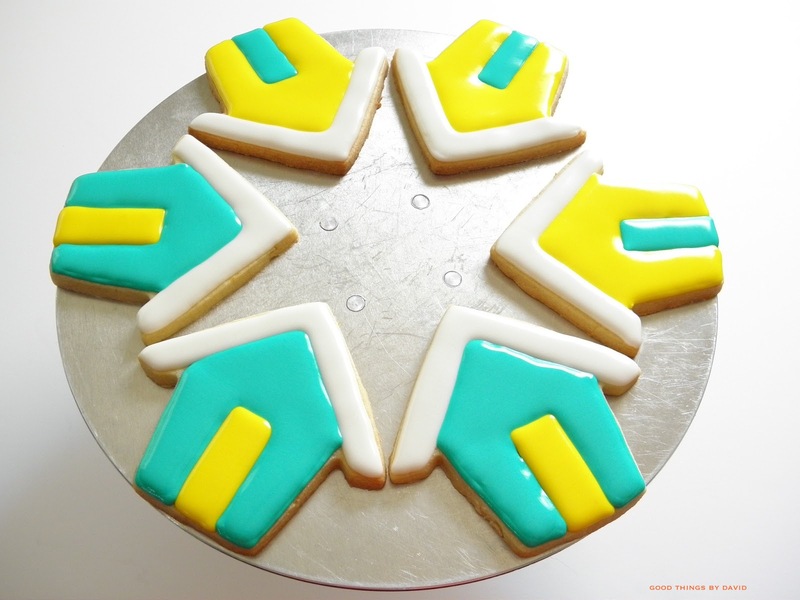 The cookies were given out as a reward to every single child that participated in this stage performance. Let me assure you, they were a hit! Keeping the sugar cookies to two shapes and only five colors, I baked and iced chickens as well as pigs for the children. Do you remember this book from childhood? I cut out large pigs using a cookie cutter from Copper Gifts and used a rooster cookie cutter that I got from my friend, Janet. 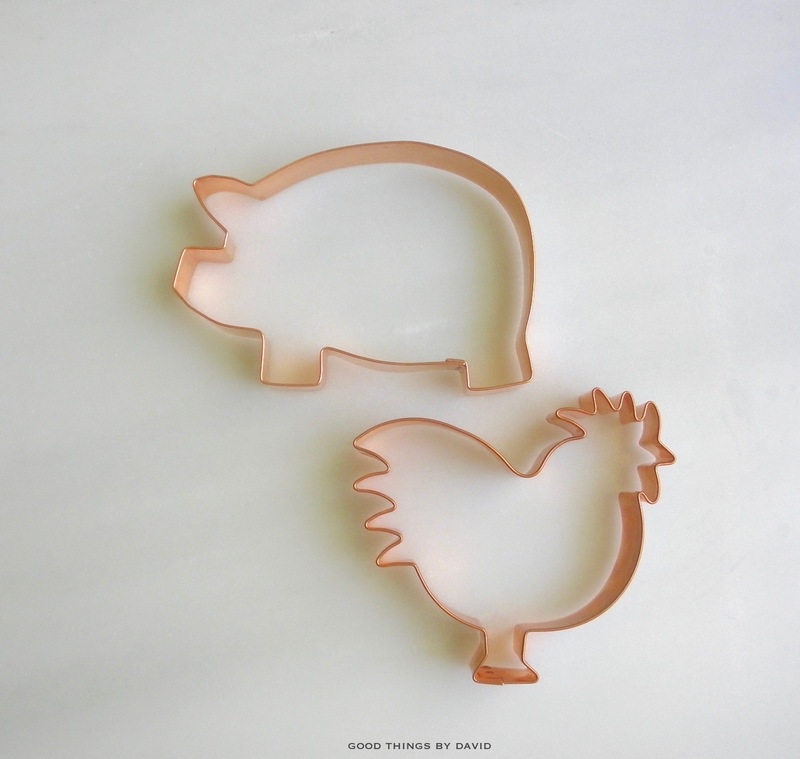 She told me that she discovered this little rooster at a specialty kitchenwares store in Carmel, California. It's really charming and makes beautiful cookies. As you've seen me do countless times, prepare to ice the cut out pig cookies by placing them on a decorator's turntable. Why do I like working this way? It's because I like to rotate the cookies while decorating; it helps me maneuver certain angles with the piping bag much more easily. The bamboo toothpick is there to help me coax the icing into corners and to poke out any air bubbles from the icing. 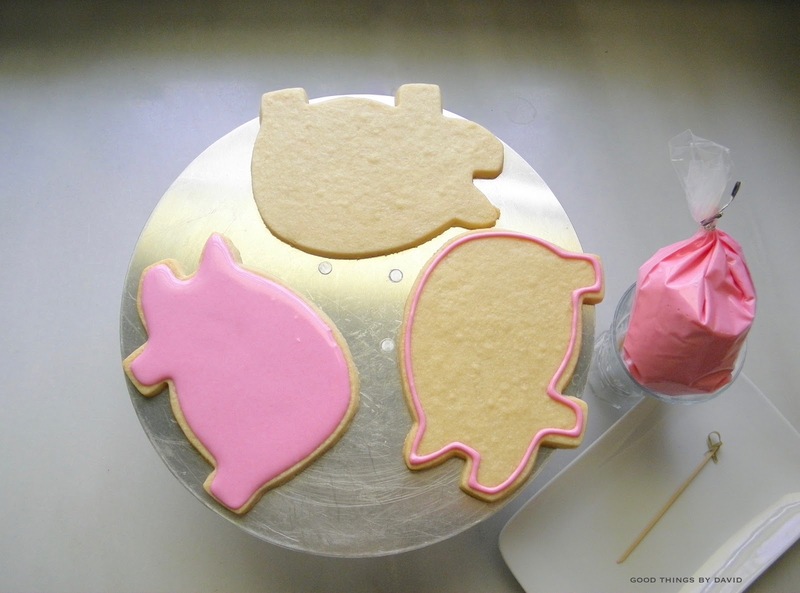 Outline and flood the pigs using a #4 or #5 plain round tip with bright pink royal icing, and let the base coats dry completely. 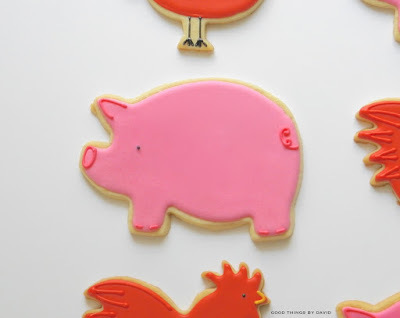 Using a little bit of fuchsia-colored royal icing for the accents and a #2 plain round piping tip, pipe a circle for a nose, a partial triangle for ears, two beads of icing for the cloven hooves, and a curly pig tail. Using a #1 piping tip, add a black dot for an eye. Let dry completely. 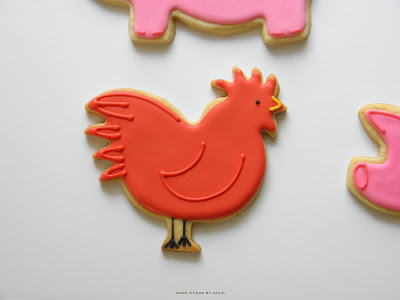 The 'little red hens' are outlined and flooded in red royal icing using a #4 piping tip. This is left to dy. Using a #2 piping tip and the same color (simply switch piping tips), pipe tail feathers and an outline for the wing as shown. 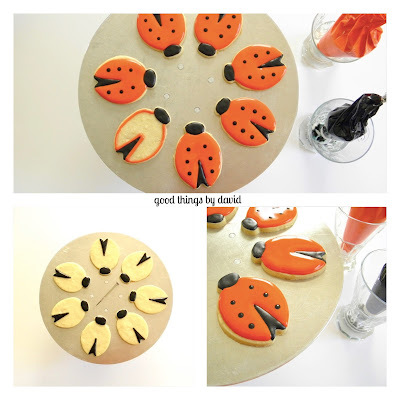 Using a #1 piping tip and black royal icing, pipe a dot for an eye and three-pointed feet and legs. 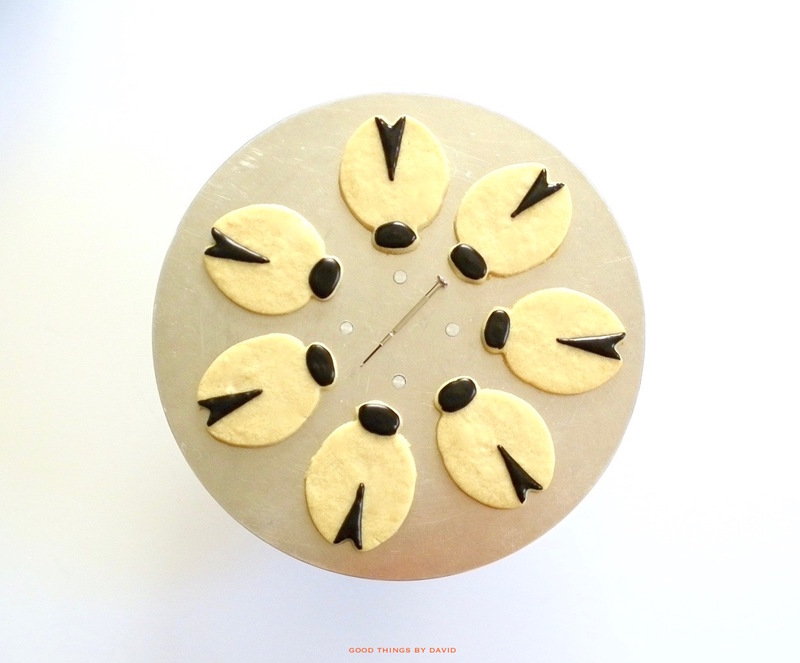 Using a #1 piping tip and yellow royal icing, pipe a small beak. Let dry completely. 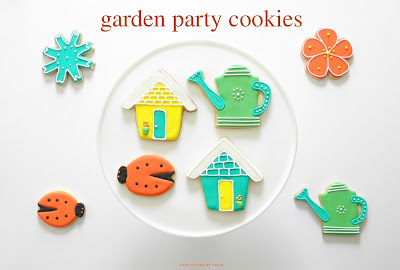 My neighbor Cathy tells me that these cookies were a big success with the kindergarteners and teachers. 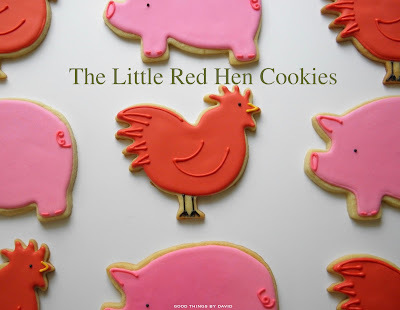 As a cookie decorator, you don't need to wait for a production of 'The Little Red Hen' at a local elementary school to make these simple cookies. Ice some for a family reunion, a spring or summer cookout with friends, or make them to sell at a local farmers market. You can also make some to surprise any neighbors or individuals who have a farm and practice animal husbandry. 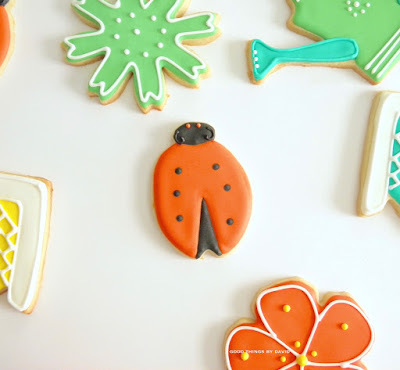 Don't shy away from using bright colors like these, because they really will stand out and catch people's attention. 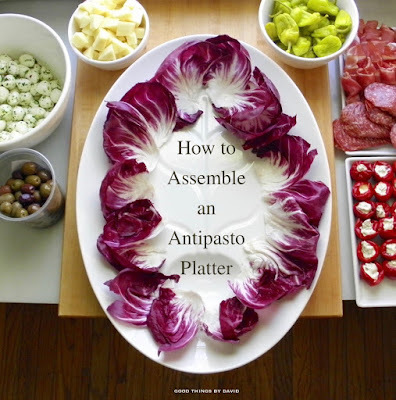 A quick and easy solution to serving a crowd when entertaining is to make an antipasto platter. Having a variety of store bought cured meats, cheeses, olives, peppers, among other items, leaves the host extra time to focus on the details of the day. Assembling these savory ingredients can be as simple as setting out a few bowls and plates of them, but if you want to create a focal point for a buffet table, get a large platter and arrange the tasty components in a colorful way. Make sure to have plenty of everything so that you make the platter look full, abundant and very enticing. 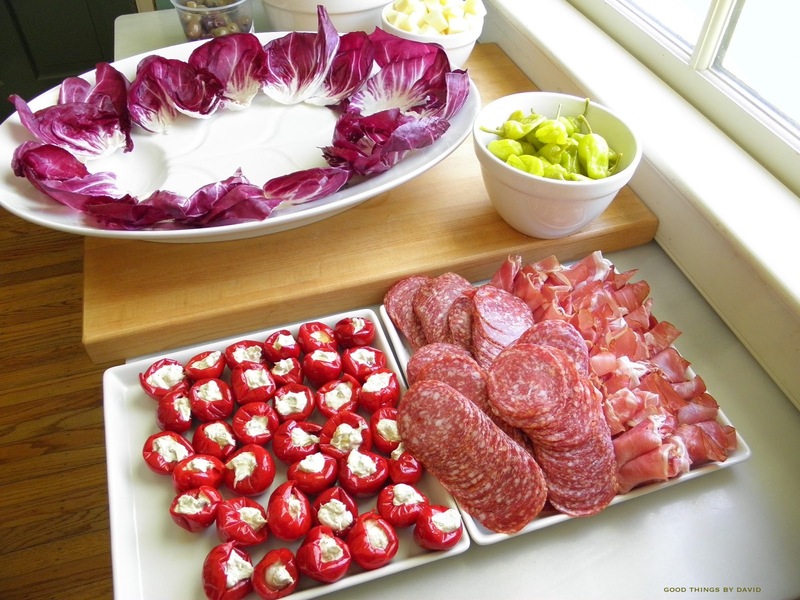 Determining what you put out for individuals is all based on your preferences, and many regions in Italy have specialty items that are a must for antipasto. Whatever ingredient combination you decide on, do purchase your ingredients from a reputable food purveyor that sees high volume sales. Luckily for me, I have Di Bruno Brothers here in the Philadelphia region that I rely on for cured meats, cheeses and savory olives. They have the best of the best, and their customers know it. Composing your antipasto platter can be done a couple of hours before guests arrive. What I advise is for you to find a platter large enough to accommodate the ingredients you will be serving. If you've bought items in bulk, it's best to remove everything from their original packaging and set them out in bowls and plates so that composing them can go like an assembly line. Line things up and pair food items based on flavors and color. 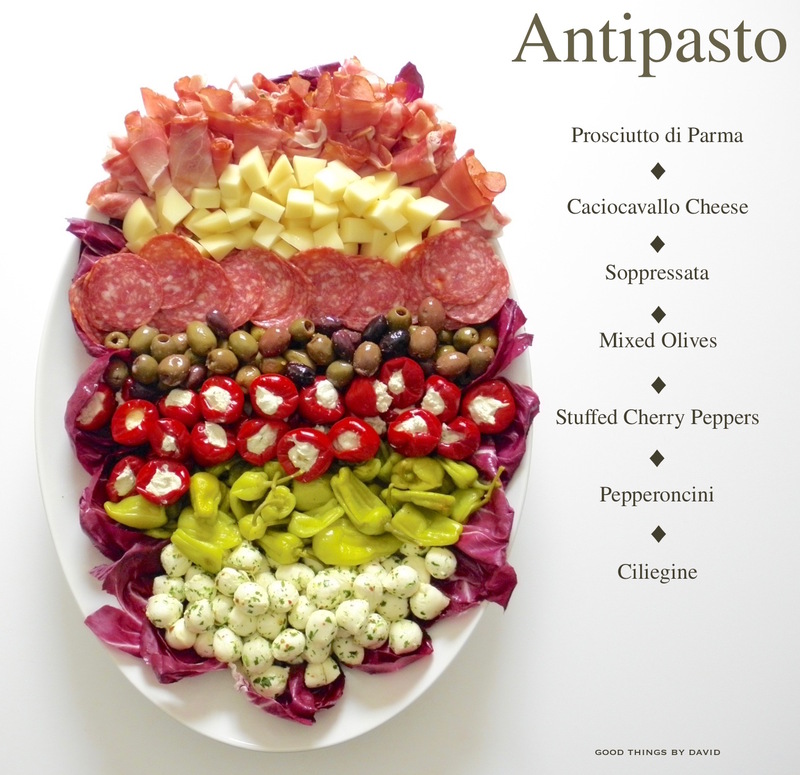 Here is an antipasto that has a good amount of delicious nibbles for a crowd. The required prosciutto di Parma is a must, as is the soppressata. Cheese items usually include provolone and baby mozzarella balls, but for this particular platter, I decided to go with a milder caciocavallo cheese which I cut and cubed. The little ciliegine were bought without any additives; these were enhanced with minced flat leaf parsley, crushed red pepper flakes and a bit of lemon zest. An offering of mixed olives add color and flavor, as do the hand-stuffed cherry peppers and pepperoncini. 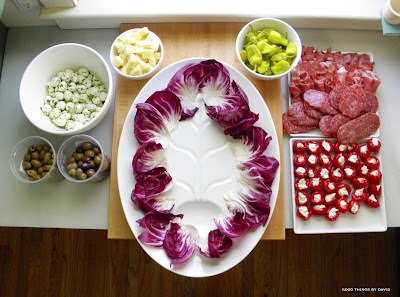 All of this is placed on a platter which has been lined with hand-washed radicchio. The cored radicchio made it easy for me to remove the large outer leaves which were placed along the perimeter of the large ironstone platter. 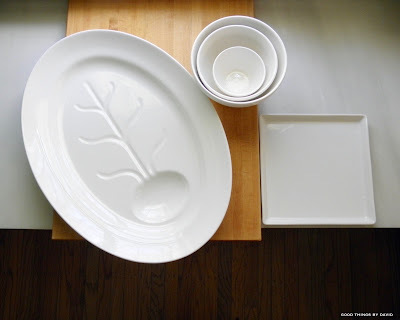 This particular platter by Wedgwood is meant for a large roast. The 'tree-in-well' pattern is designed to catch the juices of the roast and have them channel & collect at the bottom (the well). However, I saw it a perfect match for this gigantic antipasto platter. 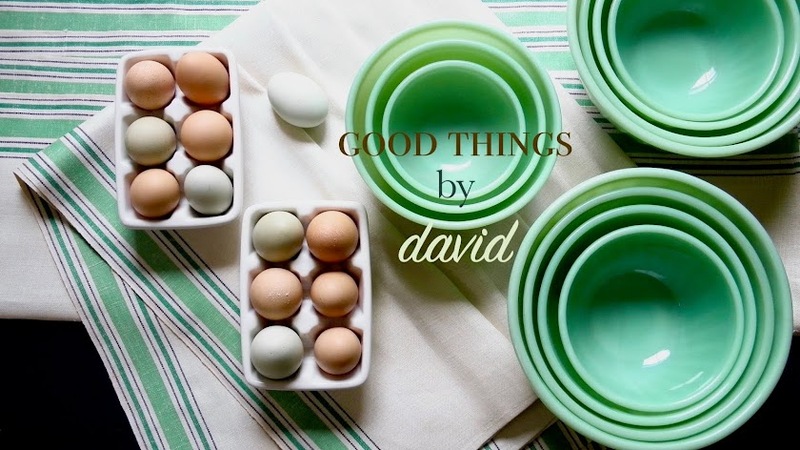 My pudding bowls and square platters were used to hold everything in place as I began to construct the platter. 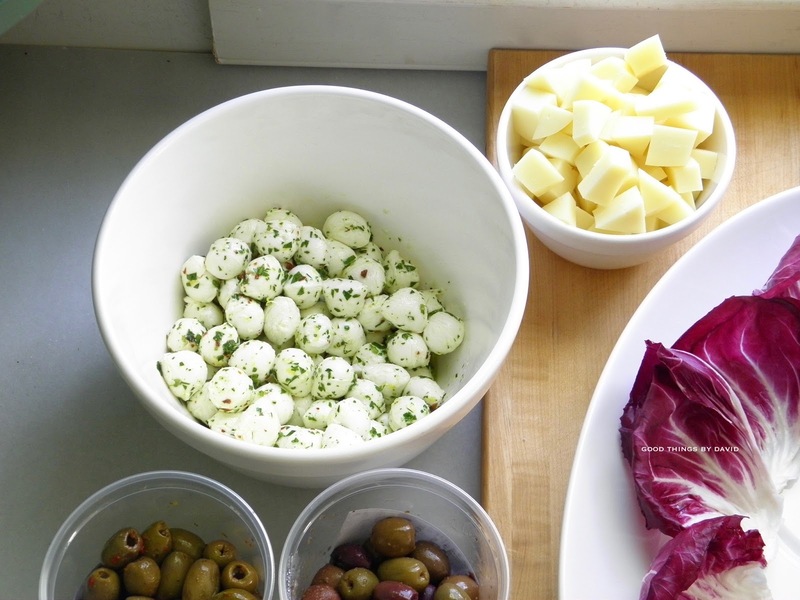 Fresh mozzarella balls are highly perishable and should be used within days of purchasing. Delicious on their own, they are greatly enhanced with a bit of seasoning. Drain the cheese of its whey in a colander and place them in a bowl. Drizzle a little bit of extra virgin olive oil, add a bit of red pepper flakes for some zip, and mix a little minced parsley and lemon zest. These are highly delicious. The caciocavallo will come in a two-sphere shaped package, almost like a brioche-a-tete. Once you remove the outer plastic casing, you can then cut the cheese in half lengthwise and then divide it into sections and cubes. The cheese is great for nibbling, but it is also great if used on pizzas or other dishes which require a good melting cheese. Look for it the next time you're in the Italian section of your gourmet market. Cherry peppers usually come in jars without any other ingredient. They are great to eat just as they are, but if you take a moment to blend a good cheese, they can be stuffed quite successfully. What I did was blend a smooth neufchâtel with some chopped artichokes, lemon zest and freshly ground pepper. This mixture was then placed into a pastry bag fitted with a 1/2" round plain piping tip, and the cheese was then piped into each pepper. Easy! The soppressata was lined and ready, and each tender slice of prosciutto was rolled up into bite size pieces. After I had everything ready to go, it was only a matter of assembling the ingredients in an appetizing way. The mozzarella balls were placed at the bottom and then the pepperoncini were stacked next to them. The other ingredients were placed alongside one another and were piled high. This was a large platter, so everything that you see here is inches deep. Placed this way, the arrangement was colorful, appetizing and very much suitable for entertaining. 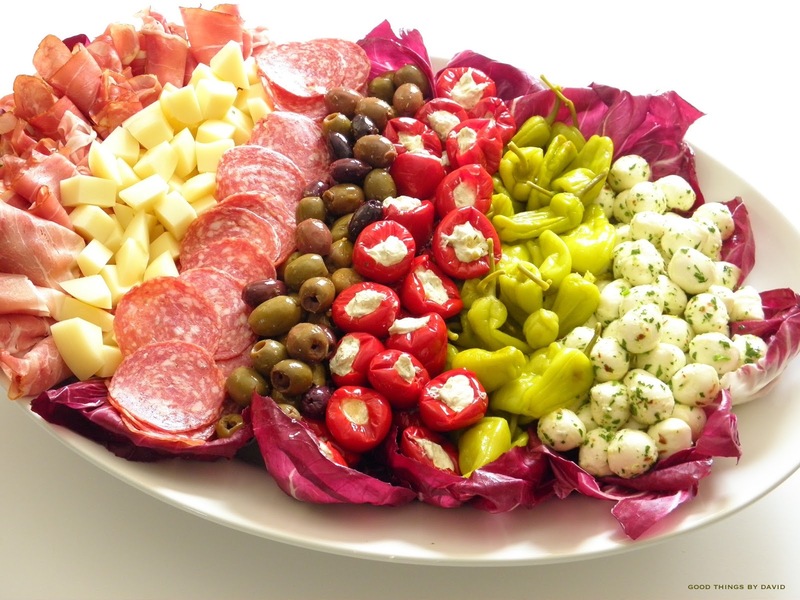 I already know of one friend who is inspired to make an antipasto platter for a book reading at his bed and breakfast this spring. An antipasto platter is a great way to serve a large party, and it's a fantastic way to create a bounty at any buffet table. Whether you use all of these ingredients or a handful of them, make sure that you have plenty so that guests feel like they can take several helpings of each item. Silver Point’s 2014 Sauvignon Blanc from New Zealand hits all the right notes for this type of varietal. Bright apricot and small hints of passion fruit and nectarine make this light wine such a pleasure to drink when the weather gets warm. Use it as a base for a delicious white sangria or enjoy a glass with your favorite seafood such as crab, shrimp, mussels or scallops. 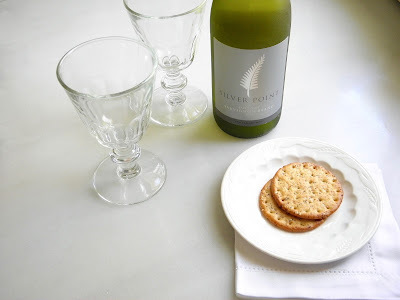 Sauvignon blancs are a favorite at my house and this one from Silver Point, will undoubtedly become a favorite with you. Enjoy!